As the relationship between Guyana and the State of Palestine continues to grow, President Donald Ramotar yesterday announced that Guyana has appointed its Ambassador in Kuwait to represent the interest of the State of Palestine. The President made this announcement following a meeting with Foreign Affairs Minister of the State of Palestine Riad Al Malki, who made a one day visit to Guyana yesterday. During the meeting, President Ramotar expressed Guyana’s commitment and support to Palestine as it relates to the current situation facing the Middle East. “The Palestinian people deserve the same rights as people everywhere: to live in dignity, security, freedom and independence, at peace with all their neighbours, and with the right to move freely within their homeland,” President Ramotar said. According to the Palestine Foreign Affairs Minister, the main purpose of his visit is to personally extend appreciation to President Ramotar for the country’s continued support to ensuring justice for the people of Palestine. 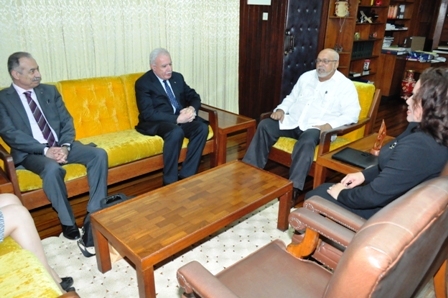 “My main purpose of this visit is to extend our thanks and appreciation as Palestine, the Palestinian State, the leadership and the Palestinian people to Guyana, the President the people and the Government for their strong committed position in support of justice around the world, but also justice in Palestine,” the Minister said. Also discussed in the meeting was ways in which Guyana and the State of Palestine can further develop their relationship, as views and ideas were expressed. According to the Foreign Affairs Minister, these ideas will soon materialize.